When juggling between different things or tasks you are multitasking. The cost of multitasking is big, very big. Each time you change tasks you lose some time to context switching. The more you switch, the more time you lose. 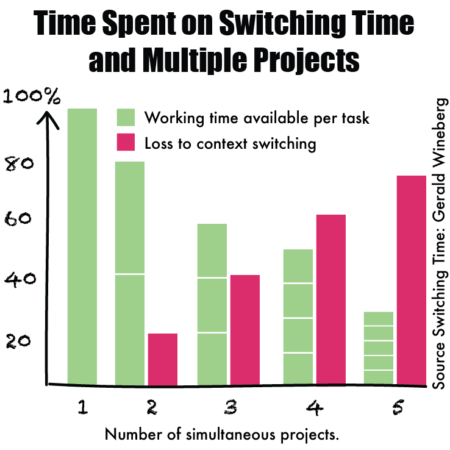 If you have 5 different initiatives, projects or tasks you spend 75% of your time switching and only 25% on your actual work. If you have only one initiative you can focus on it and get more done. It may feel counter-intuitive, strange or even scary to focus on only one thing at a time. You may feel that you are not as productive as before. But when you are not being busy juggling different things, but instead focus on only one thing, you will find that you are able to be more focused and more creative. This will lead to higher quality and earlier delivery. You will get better results faster. How do I limit WIP? 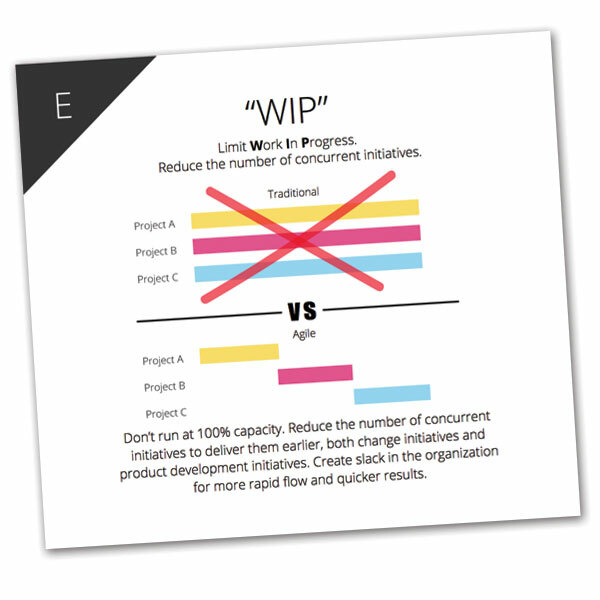 The most common use of WIP-limit is on the Kanban/Scrum board of a development team, where the columns get WIP-limits. This way the team is forced to limit WIP. This is often very beneficial for the team delivery pace and for team members stress levels. It also promotes collaboration within the team. Mostly, it is not too problematic to introduce WIP-limits on team level. Just try it for some time and see how you like it! However, on an organizational level there are other challenges to limiting WIP. Maybe there are many projects or initiatives running at the same time? Maybe there is a culture of resource optimization in your organisation? The solution of the problem must be adjusted to the organisations specific situation. One key step is management understanding that WIP-limits gives earlier delivery. In our experience, the best way to understanding something is to try it. Experience based trainings or workshops is a fast and direct way to understanding. Do you (or someone else in your organization) need understanding of Agile basics, values and mindset? Take our experience-based training Grundutbildning i agila arbetssätt.